The original item was crocheted in 1895 by Mabel Turner (later Mabel Turner-Irwin) for her hope chest. She was my Uncle David’s grandmother on his father’s side. 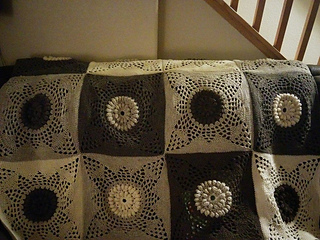 The original bedspread was done in size 10 crochet cotton thread in white. 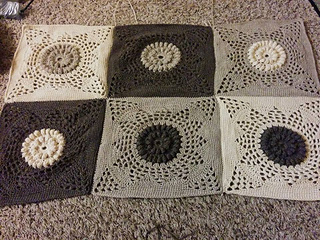 When I went to visit my uncle and aunt in Pennsylvania farm country in the summer of 2014 they showed me this bedspread (as they knew I was an avid crocheter) and asked me if I thought I could repair it, as it had been attacked by mice in their attic storage. A few months later a package arrived from my aunt and uncle - it was the bedspread with the hope that I could repair or replicate it. 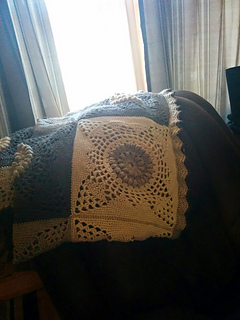 I riffed on the original pattern to make this throw for my easy chair in my living room.